This Jemini Multi Purpose Stacking Chair can be stacked up to 4 high for convenient storage. The strong steel frame with black epoxy coating and charcoal fabric upholstered seat and back provide strength and comfort. 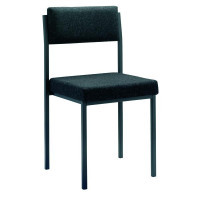 This multi-purpose chair can be used in reception areas, schools, for meetings and conferences and more.